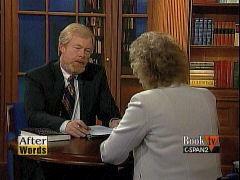 Choice excerpts of Media Research Center Founder and President Brent Bozell on C-SPAN's Washington Journal on February 22, 2008. Appearing on C-SPAN’s Washington Journal this morning, longtime CNN correspondent Charles Bierbauer, who’s now the senior contributing editor to SCHotline.com, a South Carolina political news site, equated a proposed fence to deter illegal immigration from Mexico with the Berlin Wall that prevented Germans from fleeing East Germany’s communist dictatorship during the Cold War. The “Weekly Standard” profiled libertarian-leaning conservative and political commentator turned documentarian Evan Coyne Maloney, whose new documentary about the leftist ideological indoctrination and pervasive political correctness in the US higher education system is called “Indoctrinate U”. Saturday May 19, CSPAN ran a segment about his film on the network’s “Washington Journal”, but CSPAN posts footage of the shows online (when they have it up, I'll post it. His spot is at the two-hour mark). You can see a clip of his film on YouTube as well as the film's website, Indoctrinate-U.com. 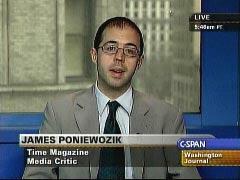 Time’s cover story on Don Imus this week is authored by TV writer James Poniewozik, and he appeared on C-SPAN’s Washington Journal on Friday morning to plug it. Well, even though Pelosi is getting let off the hook for violating the law, we in the Blogosphere are gaining a new ability: to re-broadcast C-SPAN video without fear of copyright violations. Hillary has let her sticky fingers show again. Will the MSM pay attention? 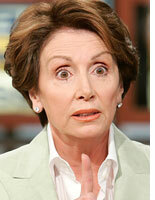 We're all familiar with her statement from 2004: "the tax cuts may have helped you. We're saying that for America to get back on track, we're probably going to cut that short and not give it to you. We're going to take things away from you on behalf of the common good." On Friday's C-SPAN morning show "Washington Journal," host Brian Lamb interviewed columnist Robert Novak in the hour of 9 to 10 AM Eastern time on his column on the unraveling of the Plamegate scandal. (Novak was in Urbana, Illinois, at his alma mater, the University of Illinois.) Perhaps the most entertaining parts were his harsh takes on Chris Matthews and Jon Stewart, whom he called "a self-righteous comedian taking on airs of grandeur." "Well, thank you. My problem here, sir, is that I never watch Chris Matthews' program because I don't feel that I can possibly learn anything from all that shouting and blathering and interrupting people. So I haven't watched his program in years. I don’t know if he said much about this and I don’t care. I can imagine that Mr. Matthews believes that being mistaken in journalism means never having to say you’re sorry. So I don’t think he’ll say much of anything." Rep. Jack Kingston (R-Ga.) noted the bias of the New York Times on C-SPAN's "Washington Journal." The show's host quoted from a pessemistic NYT story about the military situation in Mosul, Iraq. Kingston, who recently returned from an extensive trip to Mosul and first-hand talks with GI's and officers questioned the story thus: "Now, would that be on the New York Times editorial page or their regular page?" The host said the regular page. At 8:00pm Eastern, C-SPAN2 will air an interview that the MRC's L. Brent Bozell conducted with Mary Mapes, the fired CBS News producer who was behind the story that led to last year's Memogate scandal. Use this thread to comment on "After Words" following its broadcast.